Yeh Rishta Revealed Aditya crime. Naira misses her family. Naksh surprises Naira by making a grand entry in the puja. He tells her that its an important day in her life and he had to come. He keeps a promise of a brother. Kartik feels guilty and thinks he has failed as a brother for Kirti, and also cheating Naksh. He recalls the tears he has gifted to Naksh. Naksh gifts Naira’s baby for Chatti puja. Kartik gives the baby to Naksh until Naira finishes the puja. Naksh connects with the baby and tells him that he is baby’s uncle, but loves the baby like baby’s father. Kartik feels remorseful. He didn’t wish the lie to replay in front of his eyes. Everyone wishes the baby to stay happy and get a bright future. The baby clings to Naksh when Kartik takes him. Naksh gives the baby to Kartik and makes a leave. Kartik apologizes to the baby, being baby’s uncle. He tells baby that he is confused and scared. Naksh gets applauded that he didn’t lose faith in God and is moving ahead in life. Naira gets the baby’s tag and turns curious to know about it. Kartik lies to her about the baby tag. Naira tells him that if Naksh sees the tag, he will be shattering again. She reminds him that Kirti has lost the baby. Kartik gets upset and asks her not to remind him of baby loss or Kirti’s coma. They apologize to each other. They want to forget all the odds and get ahead in life. He feels he has done an unjustified act. Inspector meets Singhanias and tells them that he has got the CCTV footage of the huge accident. Naksh checks the footage and identifies Aditya’s car. Naksh tells inspector that Aditya has done this. He asks inspector to arrest Aditya, who has done everything for revenge. He regards Aditya responsible for Kirti’s coma and baby loss. 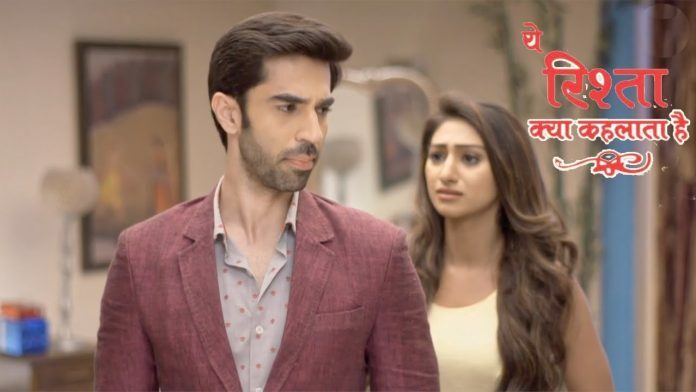 Bhabhimaa gets upset that Aditya has returned in their lives to create a havoc. Naksh swears to not spare Aditya this time. They ask the reason for raging Aditya. Naksh tells them about Naira exposing Aditya’s affair to Vaishali. Kartik receives a big shock on meeting the nurse. He begs her to leave. Dadi tells him that she has called the nurse to give her duties of Naira’s care. She tells him that nurse will handle the baby until Naira learns. She believes the nurse has good experience. Kartik doesn’t want that nurse to come to their house. Naira questions him about his denial. Naksh tells the family that he will handle Aditya. Baisa tells them that Naksh should have not let Kirti work with Aditya. Naksh tells her that it wasn’t related to work. Devyaani asks him not to feel guilty, he is a good husband and has kept all his duties. He tells her that he is responsible for Kirti’s state, as he has encouraged to take up Aditya’s job. He tells them that he ha forced her for the big contract. He fears that Kirti will hate him. The family consoles him. They tell Naksh that wrong doers will get punished. Kartik turns panicking to think that Nurse will reveal his big lie. He wants Naira to stay happy and believe that the baby belongs to her. 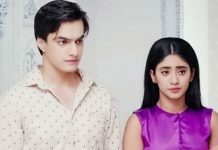 Naira wants Kartik to share his tensions.